Lets not forget that the replica boat is only a half size version. The excavated portion, which is only possibly half its length, consists of its lower extremities as well. The replica has been successfully navigated with a full crew in the open sea of the channel beyond the confines of Dover Harbour and also along the River Thames. As the River Dour, even in the Bronze Age, is only a small stream by comparison to other English rivers, where else would it go but out to sea? Another similar full size replica was also navigated within the Severn Estuary recently without a problem. There is a scheme afoot in the near future to take the replica out to sea and along the coast from Dover to Folkestone harbour. That will be a very telling event? I think I've said here beore somewhere that a vessel of this beam would have a job crossing the Channel on a regular basis. It was described somewhere as a river vessel, again due to its narrow width. I've read something fairly recently about a discovery of a vessel in the submerged ancient landscape of the Solent that had evidence that it had obviously been involved in cross channel trade. I'll try and remember where I read it a quote the source. I think I've said here before somewhere that a vessel of this beam would have a job crossing the Channel on a regular basis. It was described somewhere as a river vessel, again due to its narrow width. An Iron Age boat, of fairly similar construction, was found in the Humber and a replica built. It was tried in the sea and was not at all successful. Moss caulking let the water in, among other things. That's not to say there was no cross-channel trade, just using wider boats. The sarsen stones at Stonehenge were thought to have been brought by boat from Wales and it has been physically proved that this was possible with the right sized vessel. Tony Robinson joins a team of experts as they strive to reconstruct the Dover Boat and so unlock the secrets of this mysterious time in our past. You will need to register but its free. As well as building the half-size boat, the programme also includes items on Cross-Channel trade. Just to let you know, at present there is a team building a half size replica of the boat on what is known as the Roman lawn situated between the Roman Painted House and Dover Library. It is planned to row the boat across the Channel where it will go on show in France and Belgium. It will eventually return to England and put on display here in Dover. The official launch of the project is on Tuesday, various dignitaries will be there along with the media, so there should be something on the telly and in the papers. There will be open days for the general public which will be announced in the press and on various websites. You will be able to view the progress of the build and meet the craftsmen and craftswomen, who are using traditional tools. I will post times and dates later in the week after the press launch. Truly a magnificent discovery and if you get the chance to pop along to Dover museum to take a look then do so, you won't be disappointed. Keith Parfitt was one of those that discovered it, sure he will be able to add a personal tale to this topic. 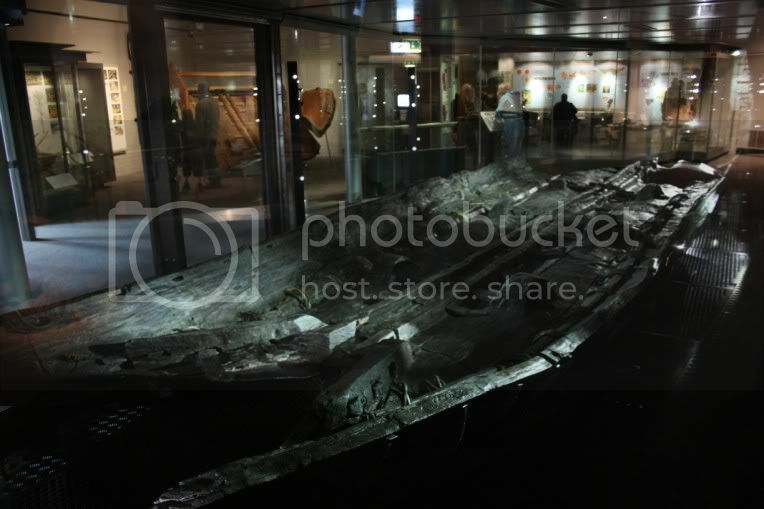 The Dover Bronze Age boat is one of the most important prehistoric discoveries to be made in this century. Similar boats and parts of boats found at North Ferriby, in East Yorkshire, before and after the war, have not been well preserved. The discovery of the boat in Dover strongly suggests early cross channel trade. The quality of the workmanship suggests a high degree of skill, specialisation and organisation. Much research work remains to be done but the boat is certainly of international significance.